Francesco Cilluffo took part in master classes with conductors such as Michael Tilson Thomas (London Symphony Orchestra), Gianluigi Gelmetti (Accademia Chigiana di Siena) and Ivan Fischer (Budapest Festival Orchestra). 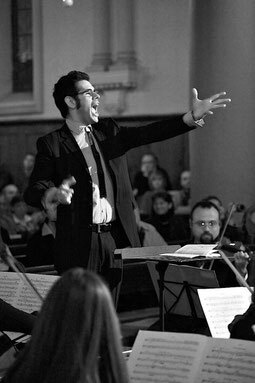 Francesco Cilluffo held a position as Italian repertoire coach at Guildhall in London and has worked as répetiteur at the opera houses of Turin (Teatro Regio), Jesi (Teatro Pergolesi), Mantua, Livorno and at the Barga Festival. He worked as assistant conductor to Rani Calderon in Verdi’s Simon Boccanegra (Opéra du Rhin, Strasbourg) and Rossini’s Semiramide (Danish Royal Opera House, Copenhagen), to John Mauceri (Danish Radio Symphony Orchestra), to Lothar Zagrosek in Luigi Nono’s Intolleranza 1960 (Teatro la Fenice in Venice), to Asher Fisch (Teatro Massimo di Palermo) and to Sir John Eliot Gardiner (Monteverdi Academy). Among his notable past appearances: Mozart’s Requiem (Levin edition) with the Orchestra Filarmonica di Torino; a new production of Marco Tutino’s The Servant at the Teatro Rossini in Lugo; a new production of Mozart’s Le Nozze di Figaro for the Byblos International Festival; Puccini’s La Bohème in Tirana; Cherubini’s Requiem in c minor with the Accademia Stefano Tempia in Turin; a symphonic concert for the MiTo Festival with the Ensemble Europeo Antidogma; a Verdi Gala with the Scottish Opera, Glasgow; Satie’s Socrate at the Barbican Center, London; several concerts and productions for institutions like the London City Festival, Saddler’s Wells and London Contemporary Dance School. He has also been a regular guest conductor of the CRT Symphony Orchestra in Italy. His most recent engagements include: Mahler’s Das Lied von der Erde (Schoenberg version) at the Festival della Valle d’Itria, Martina Franca; a cycle of concerts with the Orquesta Filarmónica de Santiago (Chile); Zemlinsky’s Der König Kandaules at the Teatro Massimo in Palermo; Duruflé’s Requiem op. 9 and Shostakovich’s Symphony no. 14 with the Orchestra Filarmonica di Torino (in the framework his 3-year long collaboration with the orchestra); a new production of Verdi’s Il Trovatore for the AsLiCo Foundation which toured Lombardy’s historical theaters and was then revived in Milan and Como; a concert tour with the Orchestra del Teatro Lirico di Cagliari in several towns in Sardinia; concerts with ORT-Orchestra della Toscana for the opening of the Incontri in terra di Siena Festival and of the Santa Fiora in Musica Festival; Cilea’s L’Arlesiana for the opening of the 2013-2014 season of Teatro Pergolesi in Jesi (filmed in DVD by Dynamic); a Verdi Gala at the Tchaikovsky Concert Hall in Moscow with the soloists and the orchestra of the Theater of the Galina Vishnevskaya Opera Centre; Mascagni’s Cavalleria rusticana at the Teatro Nuovo in Sassari; a new production of Rossini’s Tancredi for the Circuito Lirico Lombardo (Pavia, Cremona, Como and Brescia), featuring the Orchestra I Pomeriggi Musicali; a new production of Rossini’s La cambiale di matrimonio at the Teatro Regio di Parma and at the Teatro Valli di Reggio Emilia (featuring a live presentation by Alessandro Baricco); Il barbiere di Siviglia at the Teatro Carlo Felice in Genoa; a new production of Wolf-Ferrari’s Il Campiello at the Opera di Firenze - Maggio Musicale Fiorentino for the opening of the 2014-2015 season, then revived at the Teatro Verdi in Trieste; a Verdi Gala at the Festival Verdi 2014 in Parma; L’elisir d’amore for the opening of the 2015 opera season of the Teatro Regio in Parma and at the Teatro Comunale Luciano Pavarotti in Modena and then with the New Israeli Opera and the Jerusalem Symphony Orchestra at the Jerusalem Opera Festival; the world première of Marco Tutino’s opera Le braci (based on Sándor Márai’s novel Embers) for the opening of the Festival della Valle d’Itria, Martina Franca and then at the Opera di Firenze - Maggio Musicale Fiorentino; a new production of Nabucco at the Opernhaus in Kiel; a new production of Mascagni’s Guglielmo Ratcliff at the Wexford Festival Opera; concerts with the Filarmonica Arturo Toscanini in Parma; Roméo et Juliette by Gounod at the New Israeli Opera in Tel Aviv; La Traviata at the Opéra Royal de Wallonie in Liège; Rigoletto with the New Israeli Opera and the Jerusalem Symphony Orchestra at the Jerusalem Opera Festival; Madama Butterfly with the New Israeli Opera in Tel Aviv; a new production of Britten’s A Midsummer Night’s Dream at the Teatro Ponchielli in Cremona and then on tour for OperaLombardia (Como, Brescia, Pavia) and in Reggio Emilia; symphonic concerts with the Bremer Philharmoniker; Tosca at the Tulsa Opera (American conducting debut); Verdi’s Requiem at the Grange Festival with the Bournemouth Symphony Orchestra & Chorus; La Bohème for the season opening of the New Israeli Opera in Tel Aviv; Risurrezione by Alfano at the Wexford Festival Opera; the world premiere of Marco Tutino’s Miseria e Nobiltà at the Teatro Carlo Felice in Genoa; L’Italiana in Algeri at the Opéra de Toulon; Mascagni’s Isabeau at the Opera Holland Park (London); symphonic concerts (Ravel, Fauré, Casella) for MiTo in Milan and Turin. Future engagements include: Leoni’s L'Oracolo and Giordano’s Mala vita at the Wexford Festival Opera; Poulenc’s La voix humaine (with Anna Caterina Antonacci) and Mascagni’s Cavalleria rusticana for OperaLombardia (Pavia, Cremona, Como, Brescia) and in Bolzano; Falstaff for the Marche Opera Circuit (Fano, Ascoli, Fermo, Chieti); a new production of Falstaff at the Grange Festival; Mascagni’s Isabeau at the New York City Opera. Born in Turin, Francesco Cilluffo received his conducting and composition degree from the Conservatorio “Giuseppe Verdi” in his hometown and graduated in Musicology from the Turin University. He furthered his studies in London, where he was awarded a Master in Composition (with distinction) at the Guildhall School of Music and Drama and a PhD in Composition at King’s College, London.